We, like most people, usually only eat turkey at Christmas. This is silly as it’s a really tasty meat (much superior to chicken in our opinion) and is also really cheap. We picked some turkey legs up in a supermarket for just a few euros. You need to soak the fruit for 12 hours before you cook the turkey. 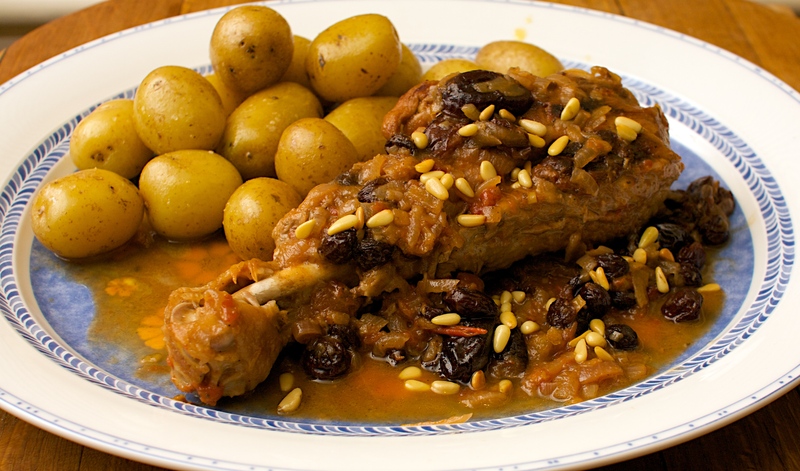 Put the raisins and prunes in a bowl and pour over the vino rancio or sherry. Leave to soak for 12 hours. Thinly slice the onion and season the turkey legs with salt and pepper. Heat a wide pan over a medium heat and add most of the oil. Brown the turkey for about 10 minutes or until its golden all over, then add the onions. Fry the onions and turkey for another 10 minutes, stirring often, until the onions caramelise and turn dark golden brown. Drain the vino rancio or sherry from the fruit and add to the pan. When most of it has evaporated, add the chopped tomato and cook until everything is well caramelised. Pour in the water, turn down the heat and simmer for 30 minutes. Add the raisins and prunes. Cover the pan and leave to cook for another hour, or until the turkey is really tender and the sauce is thick and delicious. Meanwhile, heat the rest of the oil in a frying pan and cook the pine nuts over a low heat until golden. Lift the turkey onto a serving dish, cover with the sauce and sprinkle with the pine nuts. Wine Suggestion: Stick to the Spanish theme here we think. You could always have another glass of Sherry or try a Spanish red. We had a fantastic wine called Bráo made by a producer called Acustic from Montsant (which is beside the better known region of Priorat), just south of Barcelona. Pick one up in Bubble Brothers while they still have some left! !